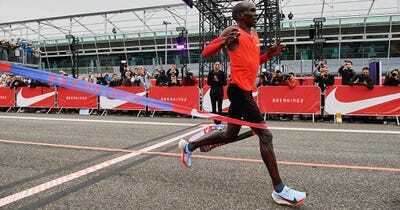 Nike posted third-quarter earnings that beat Wall Street’s expectations. The shoe maker’s positive forward outlook shows Nike regaining market share from Adidas in the US. 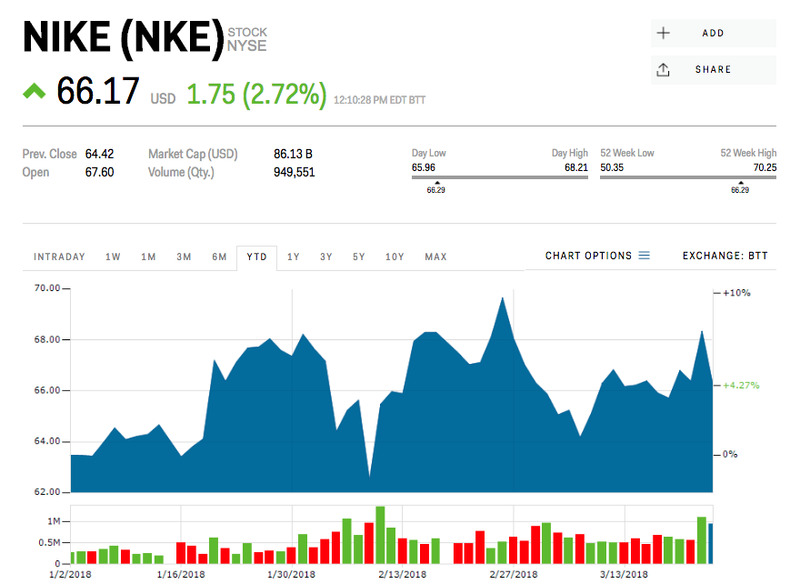 View Nike’s current stock price in real time here. “Nike US is back in business,” Jefferies analyst Randal Konik wrote in a note to clients. The footwear maker blew past Wall Street expectations, reporting an adjusted earnings $US0.68 a share on revenue of $US8.98 billion. Those figures topped the $US0.53 and $US8.85 billion that analysts surveyed by Bloomberg were expecting. Nike also delivered a solid sales forecast, with CFO Andy Campion saying he expects US sales to grow again in the first half of 2019. Executives were optimistic that Nike’s consistent release of new styles and colours for its popular VaporMax and Epic React models should support accelerated sales growth. Shares of Nike were up 2.9% Friday. Nike’s sales in North America fell 6% in third quarter, though they rose by 13% in Asia and Latin America. Its North American sales growth began slipping last May, when it posted flat results. Last quarter, the company saw a 5% decline in revenue from North America. The maker of the popular Jordan Brand was nearly written off last year when its sales slumped and it began to lose its “cool factor.” An industry watcher said Nike’s fall from grace stemmed from the supply of its Jordan Brand sneakers outpacing demand and its inability to get its trendiest shoes to market fast enough. By contrast, Adidas has been gaining US market share by offering new and differentiated products, reacting quickly to market demand, and outlining a clear strategy under CEO Kasper Rorsted. It’s sales soared 74% year-over-as of May. Yet the tables may be turning back in favour of Nike. 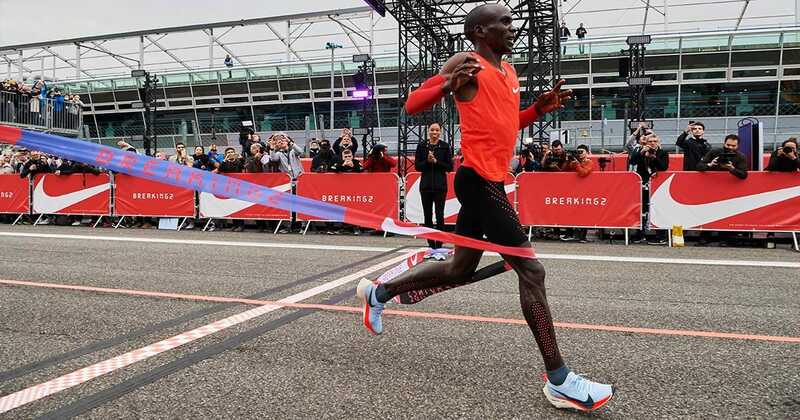 “Several F3Q updates boost our conviction that Nike is finally poised to reverse 2 years of share losses,” wrote Michael Binetti at Credit Suisse. He said the shoe retailer’s scaling of new products, positive sales growth guidance, as well as accelerating international momentum supports the “high quality” fundamentals that will precipitate the sneaker maker’s comeback. Binetti reiterated his “Outperform” rating and $US78 price target. 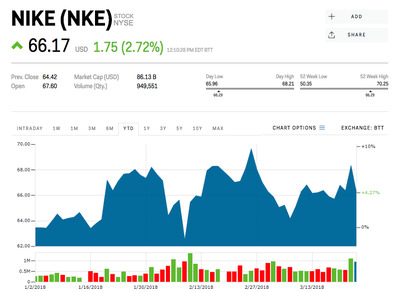 Nike’s stock was trading at $US66.31 per share, and was up 4.47% for the year. Read more about how Nike may have a secret weapon to help it sell its sneakers.